Just before the city was ready to wake up (around 6.30), we found ourselves already on the platform of the Kanazawa station. 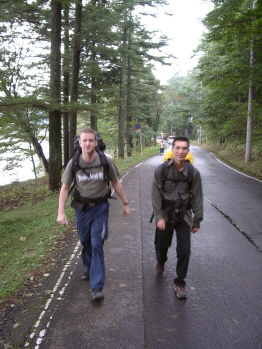 We had a long day in front of us, a day to travel from the Sea of Japan to the Japanese Alps. Despite of the super high-tech and spaciousness, working on the train did not come easy. Batteries of our computer last only about an hour, but electricity plugs were nowhere to be found! 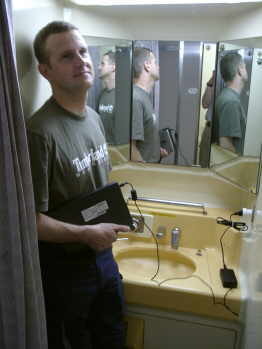 That is how we come to be acquainted with the plugs for shavers in these tiny cabins. Regarding this issue, we are going to send an e-mail request for an improvement to JR! 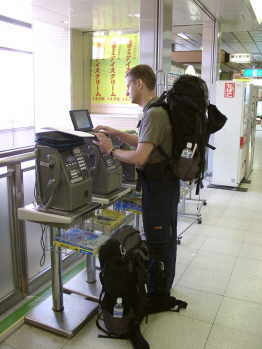 Well, as Japanese are polite people we have never been asked what we were doing with a notebook and various cables. 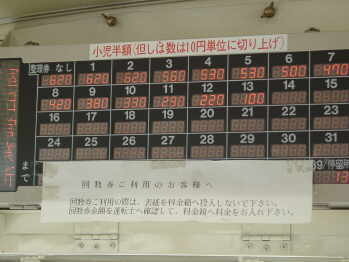 Our JR Rail Pass helped only half way to Takasaki today. From Takasaki station we were to have a 90 minuten ride toward the Japanese Alps, and this bus is not run by JR.
We were sure that the internet access will not be available in the mountains, so we used a short pause to upload our reports from the public phone in the Takasaki station. It may sound funny, but gray public phones with ISDN written on their sides brought us to clap hands and made us happy every time we saw them at cities we visited. Even though such possibilities for a modem connection can be found very often, we have not seen anybody - except ourselves - using it. Of course we experienced this not only by NOT seeing it but also by often thrown questionable looks at us. 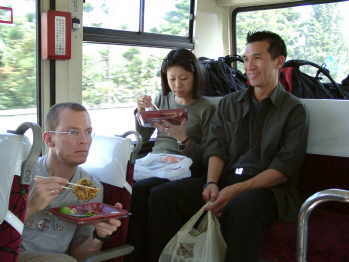 After successfully uploading our report, we equipped ourselves with Japanese lunch boxes (Bento) and got on the bus. Afterall, we have a long ride ahead of us and our appetites had to be fed during this time. On the last row of the at least 25 years-old bus, we had a bit of difficulties catching our food with the chopsticks..
At one of the short stops, the bus driver talked to us about something. We assumed he complained about the eating on board, but it turned out that he just wanted to let us know that it may be difficult for us to find a trash bin on the mountain and therefore to advise where we can find one before we go up the mountain. 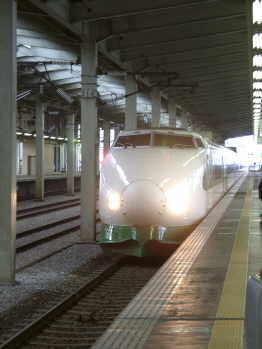 Finally we arrived in Haruna. It is a nice, thinly populated region around a volcanic lake. From the bus stop, we still had some miles to go by foot to our accomodation. We were disappointed that it started to rain strongly as a long hike was planned for the afternoon. So we ended up enjoying only a few miles of walking until we arrived at our accomodation. For tonight we chose a new kind of accomodation. We stayed at a `Kokuminshukusha`, a state-owned and operated facility. 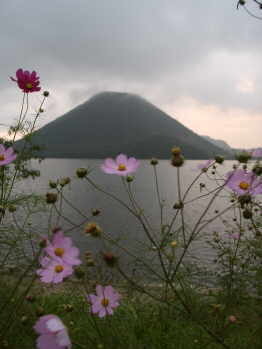 They are usually located in the beautiful natures of Japan and cost much less than private hotels. 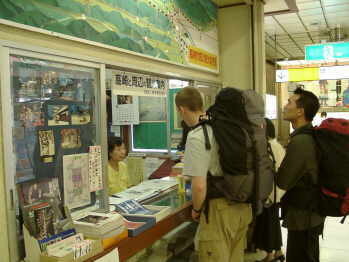 In the beginning, we worried whether Gaijin (foreigners) were allowed to stayed here as well. But they welcomed us with ever-present smiles. 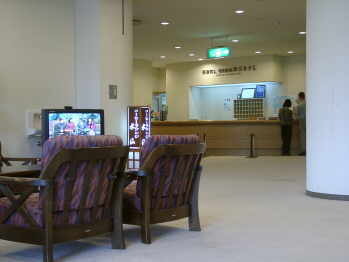 The lobby of the hotel was decorated in a western style, but our room was a Japanese Tatami room. Today we had ëonlyí 11 Tatamis. Finally the heavy rain stopped but the thick cloud stayed low. We were not sure, whether the thick clouds over the crater of `Haruna-Fuji` were early sign for an upcoming eruption or simply low hanging rain clouds. Dinner and breakfast are normally included in such facilities. 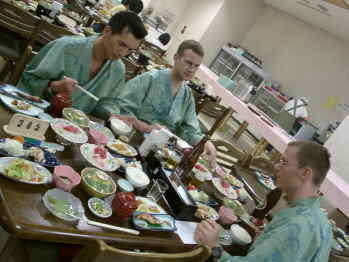 So we found ourselves punktually at 18:00 in our Yukata (summer kimonos) in the restaurant. Many traditional delicious dishes from the region filled our table. This crooked photo is not due to the fully drunken hand, but we just tried to avoid including other guests in our photo. For some reason we were requested to order the drinks to the dinner at the time of check-in already. Does it have to do with minimizing the inventory space of their fridge? We did not get to find out why. 4) What is the object on the photo ?